The magnificent Muiredach’s cross at Monsterboice, Co. Louth. Standing at over over 5m tall, it represents one of the finest pieces of early medieval sculpture in Ireland. 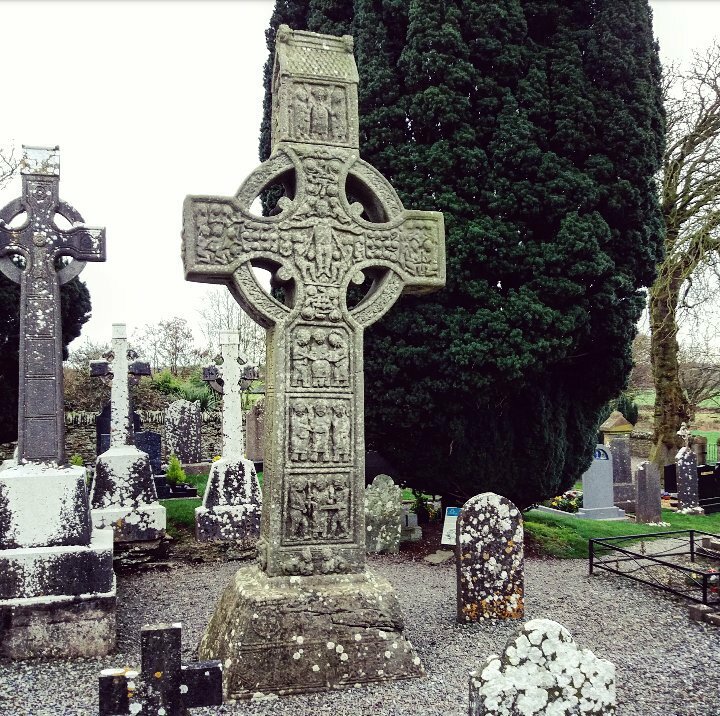 It is undoubtedly the work of a master stonemason (or team of stonemasons) and the art historian Roger Stalley has suggested that the same person may have also carved the High Crosses found at Kells, Durrow and Clonmacnoise. The cross is fashioned out of sandstone and contains a depiction of the crucifixion on its west face and the last judgement on the reverse, with the chosen on one arm and the damned on the other. The cross shaft is profusely decorate with biblical scenes that have been divided into a series of panels. The east side of the cross is adorned in Old Testament scenes, while the west side is decorated with depictions from the New Testament. Although quite worn now, originally these panels would have been quite striking and may even have been painted in bright colours. To a largely illiterate congregation they would have been a simple but very effective way of teaching the bible. 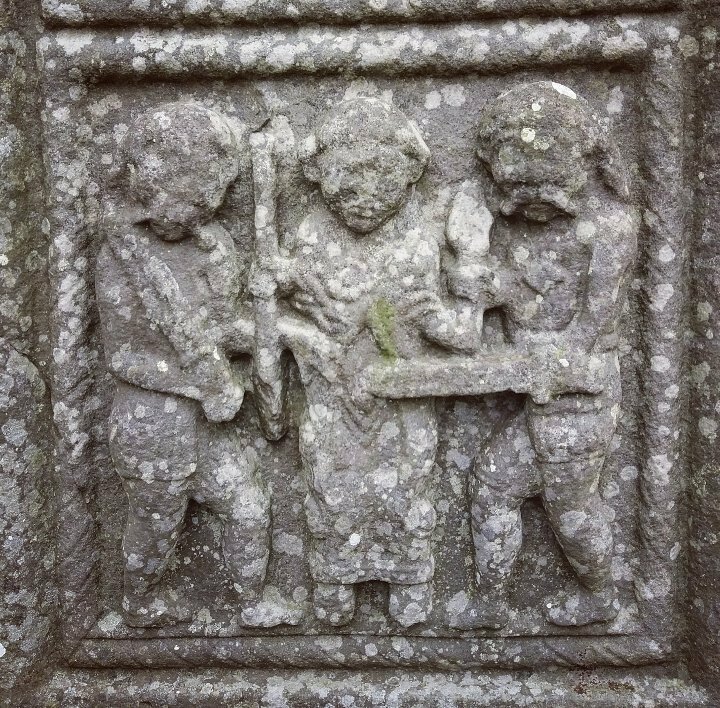 An inscription on the base of the cross indicates that it was commissioned by a man named Muiredach, most likely abbot Muiredach mac Dohhnaill, who died in AD 923. 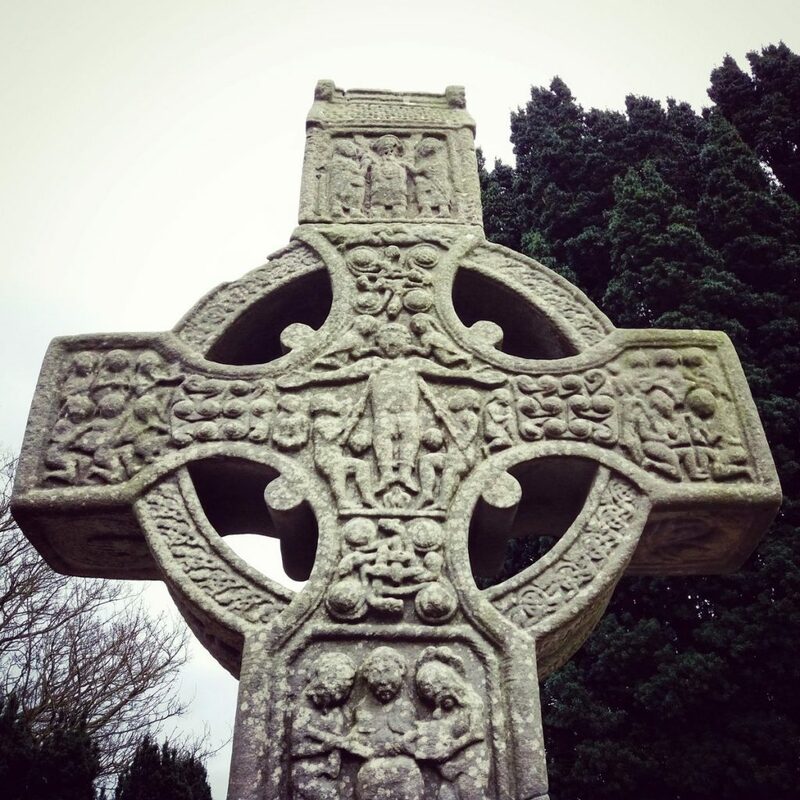 (OR DO MUIREDACH LASNDERNAD…..RO, which roughly reads,’A prayer for Muiredach who had the cross erected’). 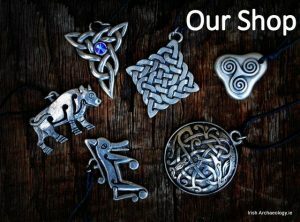 Founded sometime in the late 5th century by Saint Buithe, Monasterboice was an an important early monastery and this is reflected in the variety of historic remains found at the site. In total, there are three upstanding high crosses, two stone churches, a sundial and an impressive round-tower present. 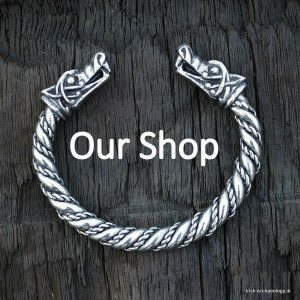 Such an obviously wealthy site attracted envious eyes and in AD 968 the monastery was ransacked by the Vikings, who subsequently set up camp there. 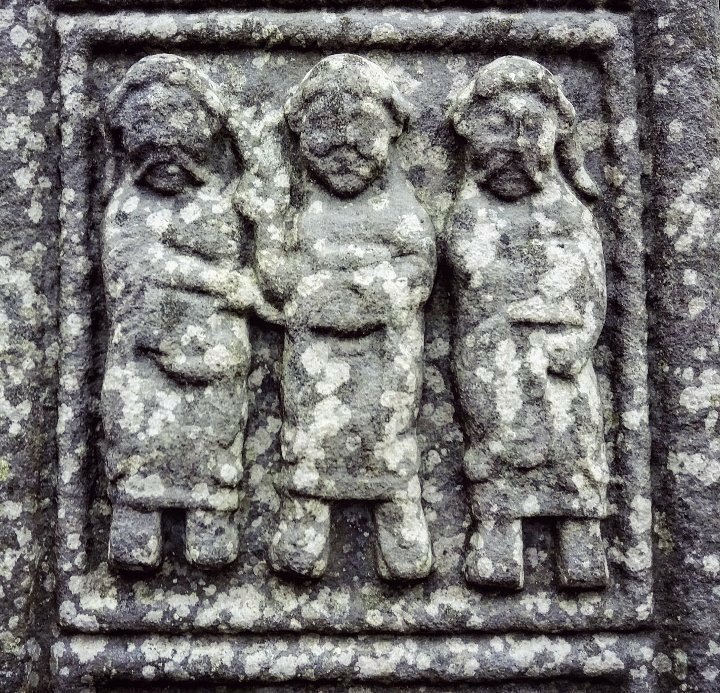 However, their stay at Monasterboice would prove a short one, as shortly afterwards they were attacked and routed by the forces of Domhnall ua Néill, ‘king of Ireland’, who killed ‘three hundred and fifty‘ Norsemen (Annals of the Four Masters). The site was further damaged in AD 1097, when the iconic round-tower was burned, probably during another attack, and the ‘books and many treasures‘ stored inside were destroyed (ibid). 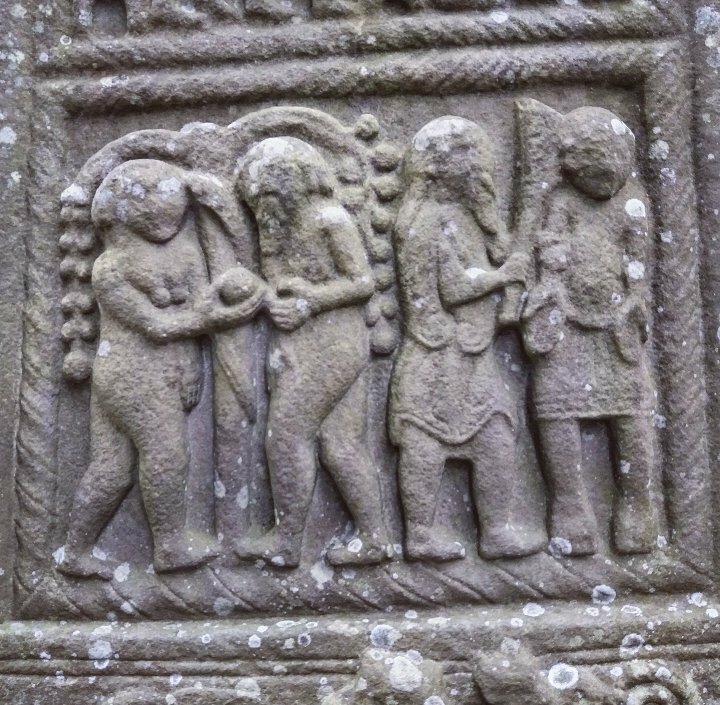 The monastery survived these vicissitudes and continued to be important place of worship into the later medieval period when it was gradually superseded by the nearby Cistercian foundation of Mellifont. Although today the bustling monastery is no more, its quiet ruins still make a wonderful place to visit. Located a short distant to the north of Drogheda town, it is easily accessible from the M1 motorway. Buckley, V. & Sweetman, P. D. 1991 Archaeological Survey of County Louth, The Stationery Office, Dublin. LOVE it, want to visit ASAP, Finishing a Painting as We speak….. Thank You …..